Whether you are creating a new garden or redesigning an existing one, the reality is it won’t be cheap. When the budget is low but the ideas are big, follow these four steps to stretch the dollars you have and prioritize where to spend them effectively. A beautiful pathway doesn't need to cost a fortune. look without breaking the bank. Create a Master Plan. 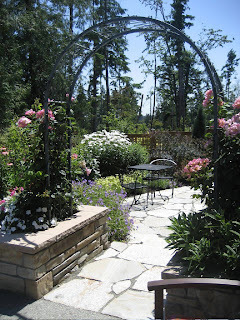 Hire a professional landscape designer to draw up a master plan and develop a phased installation. Having a clear direction will help you avoid costly impulse buys or missing an opportunity to create something unique. Hardscape First. Creating a garden is like building a house. You need to build the walls before you can hang the pictures. In the same way the framework of paths, patios, fences and arbors (the hardscape) needs to be set in place before the plants. This is the most costly part of any landscaping project but there are ways to ease the budget. Consider concrete pavers instead of stone for a patio for example. Or just lay gravel initially which can be the base for a patio later. A mulch path can also be an interim solution for a future flagstone pathway. Doing some or all of the work yourself will save on labor costs and working a design around standard sized fence panels and arbors will avoid custom charges. and an archway transformed this space. Soil Preparation. Don’t spend a penny on plants until you have spent a dollar on the soil. This is NOT the place to cut costs except to do the shoveling yourself. Without this step any money spent on plants could be wasted. At the very least take the opportunity to add compost to your soil. Heavily compacted or clay soils are likely to need more extensive amendment; ask your landscape professional for advice on the best approach for your project. Plants - at last! For most of us this is where the fun starts and it is also the easiest way to stretch your gardening dollars. Start with the trees as they take longest to establish but lend an air of immediate maturity to your garden. Buying these as bare root plants in early spring is cheaper than after they have been potted up. Buy smaller sizes of shrubs (1g rather than 5g) and be patient! A 1g shrub may only be $10 whereas the 5g size could be $40 or more. If your plan calls for perennials and grasses you may be able to divide these into several plants. Good planning is the key to staying on track financially while still enabling you to realize your garden dreams without sacrificing style. This article has been adapted from one which I originally wrote for the Washington State Nursery & Landscape Association.